Transformations are classes which allow to transform a file from state A to state B. For example, in the Product Asset specific case, they transform a file coming from a Reference (A) to a Variation file (B). Each Variation is a transformation of a Reference. Php5-gd is used in Akeneo PIM but you can add you own library to transform your file. The supported file formats are jpg, png and gif. As Transformations are not specific PIM elements, they are located in \Akeneo and not \PimEnterprise . Then, you can find in Akeneo\Component\FileTransformer all business code and in Akeneo\Bundle\FileTransformerBundle all Symfony2 specific implementation. Transformation runs with the registry pattern. 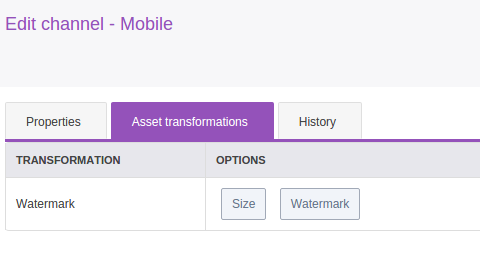 You have to create your own Transformation implementing Akeneo\Component\FileTransformer\Transformation\TransformationInterface and register the service with the akeneo_file_transformer.transformation tag. Then, compiler pass will inject your tagged Transformation in the registry which will make it available. Learn more about registry pattern. This cookbook assumes that you already created a new bundle to add your new Transformation. Let’s assume its namespace is Acme\CustomBundle . For the need of the cookbook, we’ll add a watermark transformation. To learn more about this transformation you can read the ImageMagick watermark documentation. your transformation has to implement Akeneo\Component\FileTransformer\Transformation\TransformationInterface. your transformation must have a unique name. your transformation service must be tagged akeneo_file_transformer.transformation. To see how the imagemagick command is launched, you can take a look at the Akeneo\Component\FileTransformer\Transformation\Image\ImageMagickLauncher class. your OptionsResolver must implement the Akeneo\Component\FileTransformer\Options\TransformationOptionsResolverInterface. You can learn more about this Symfony2 component in the OptionsResolver documentation. Once you created your YML file you can go to Akeneo PIM and then start importing with the asset channel configuration import in yml profile. Be careful, if you import only the new channel configuration file, all your previous configurations will be removed. You need to add your old configuration(s) in the file to keep it.